In my group's quest to complete an Axles and Alloys campaign (more on that later), I started thinking about how to make "towns" and "centers" of humanity (think Mad Max II's refinery). A quick Google search for pics of Mad Max II only shows three photos from the movie: a long shot of the entire refinery complex and then two stills of a gang member getting toasted by a flamethrower in front of the refinery's gate. After studying the photos, I saw that I'd need to make tire stacks as walls for either side of the gate. 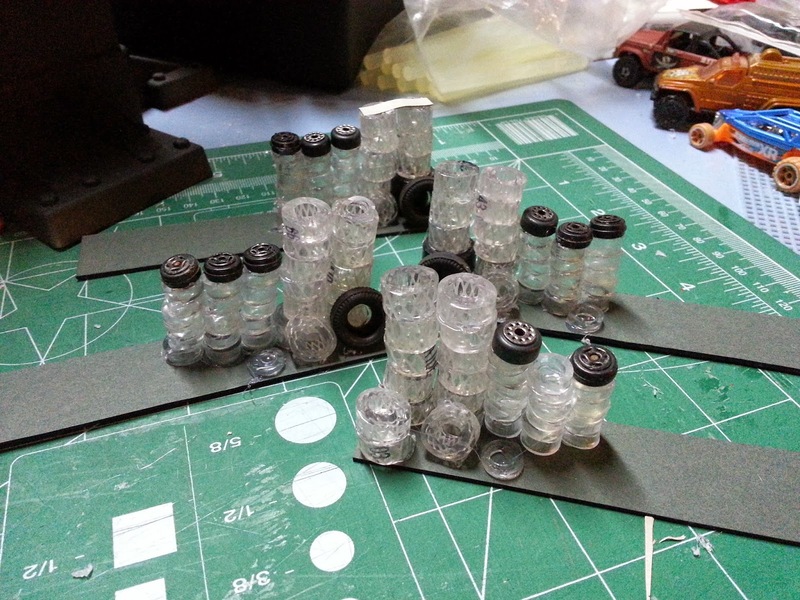 Another quick Google search of "How to make miniature tire stacks" utterly failed. Another try, using "How to make HO scale tire stacks" yielded what I needed from a page on Trainweb.org. Below is my tutorial on making these cool stacks. I went to my local hardware store and bought two, one foot segments of flexible tubing of different diameters. I wanted the tires to be of different sizes, so made sure to buy two different kinds of tubing. Total cost was $1.25. The tubes' surfaces were smooth, so I used sandpaper to roughen them so they'd take paint easier. 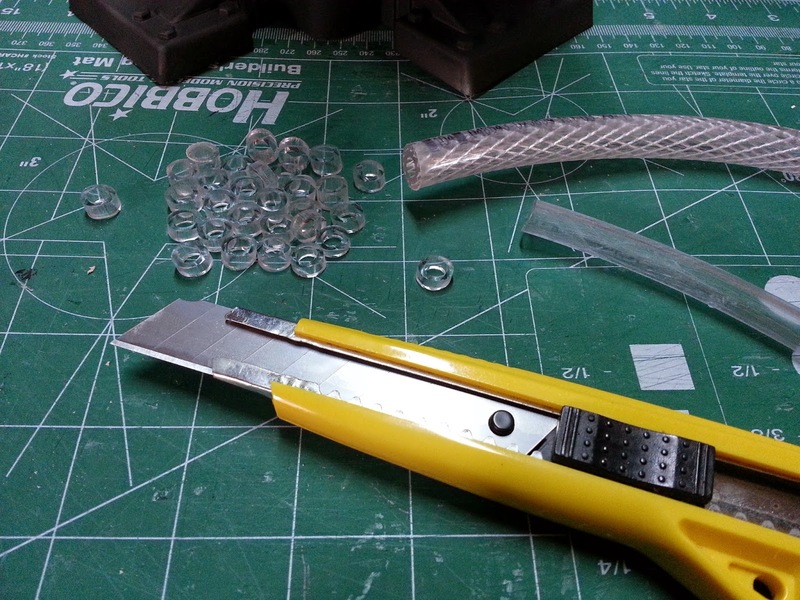 I then cut the tubing into sections, making sure to vary my width to simulate different tires. Note - Make sure that you lay the tubing flat, with the curved ends pointing down. If you don't, you stand the risk of making irregularly shaped tires. This can be useful for making leaning stacks, but they may look "off" to the discerning eye. When that bit was completed, I then separated the pieces into four groups. My reasoning was that if we are running two scenarios at the same time and they are both attacks on compounds, I'll need two sets of stacks. I wanted the bigger tire stacks flanking the entrances, so made sure to use the larger pieces of hose first. I threw in a few toy tires for effect. Next, I cut the mat board (you can use cardboard) into 1" x 4" strips. This proved longer than I needed, but the extra length provided me with a place to hold the pieces during construction. 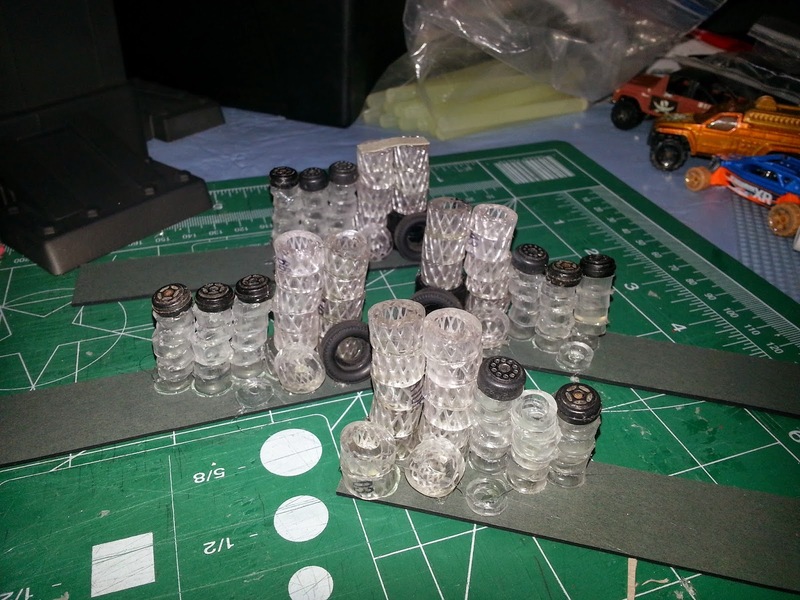 The stacking process was simple: Hot glue the pieces together. I started by gluing the bases onto the mat board and then layered up from there. 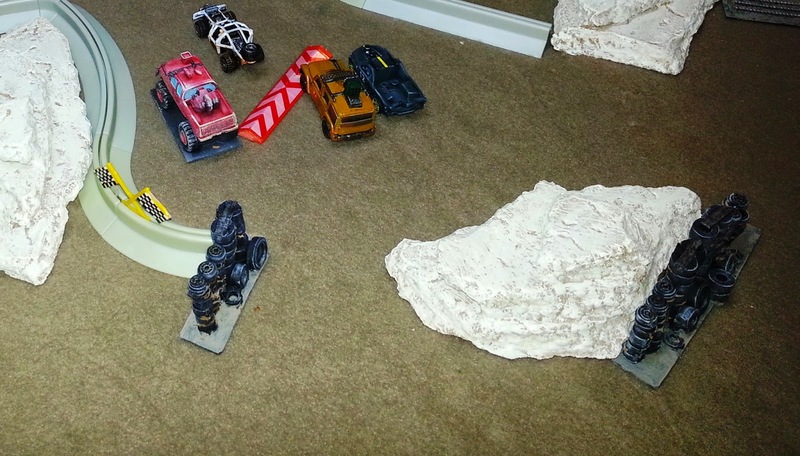 I used my tallest vehicle (i.e, Motherload) as my gauge for the wall's height. I figured that if the driver of the vehicle can't see over the wall, then it's tall enough. 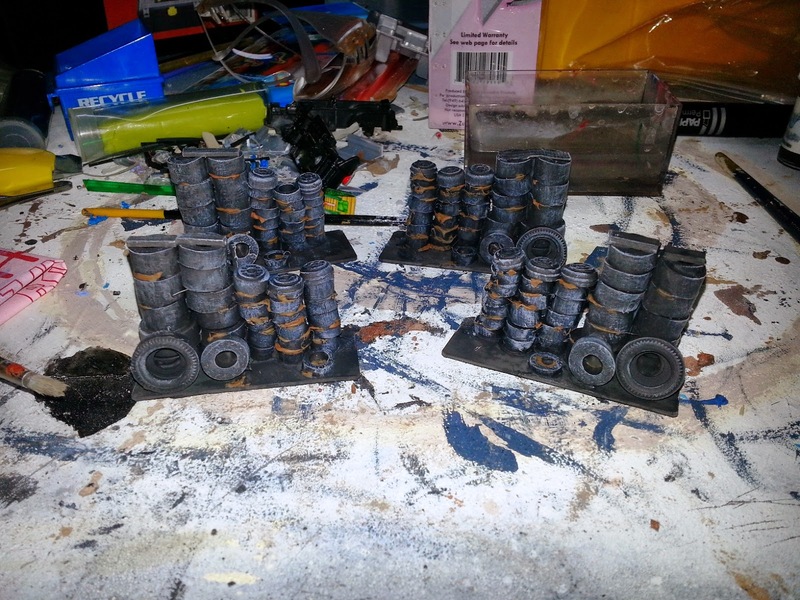 When the larger sections were finished, I started on stacks using the smaller tires. 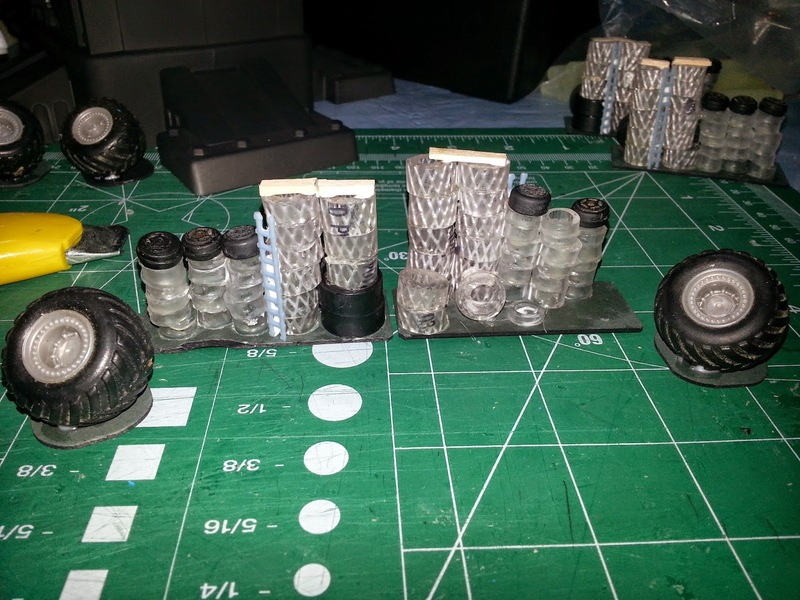 As you can see from the pictures, I used toy tires to "cap off" the stacks. After all four walls were built, I used an old brush and applied white glue over the entire surface area to give the tires more texture and solidity. I tried to use brush strokes that moved around the circumference of the tires so I could have "tread" when I painted them. Allowing for drying time, I cut out some needlepoint grid (aka granny grid) to use as ladders. I think the results look great! I also cut small pieces of craft stick to use as platforms for the weapons that will eventually be on top of the stacks. I glued all of these bits into place and again let the glue dry. 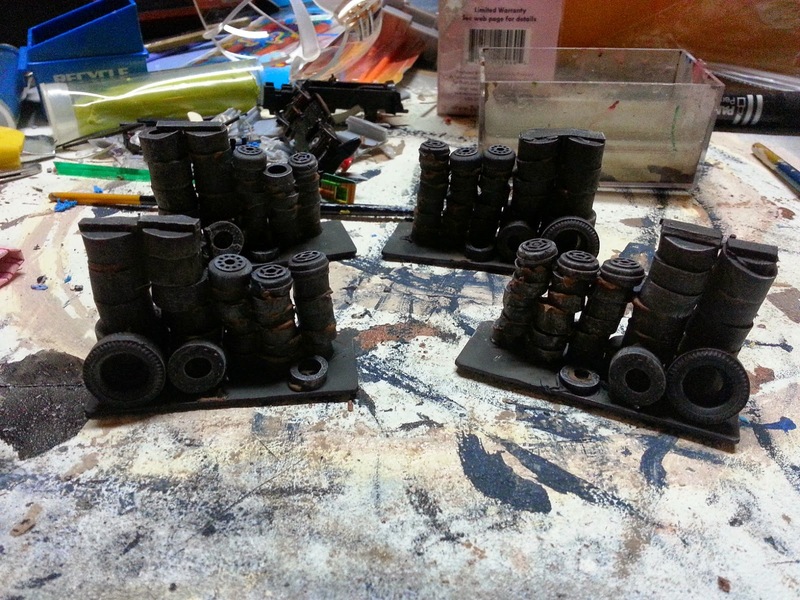 Next, it was time to primer the stacks with black paint and then drybrush gray onto the tires. I used metallic gray on the ladder and platforms. Orange and brown inks and Georgia Clay orange paint created both dust/dirt and rust stains on everything.